There are endless products for every type of skin condition under the sun. You name it they’ve got it! So why are we any different? 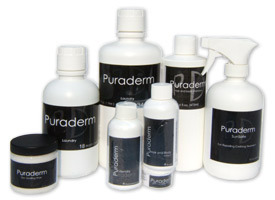 What makes Puraderm’s products worth Trying? The simple difference is residue free soap and laundry detergents. We don’t just say it either, we mean it! Our laboratory tests prove that absolutely no chemicals are left after proper rinsing. This means that nothing is left to irritate your sensitive skin. To prove the difference we want you to try our samples, just cover the shipping!